The Upwey Potters are a group of ceramic artists who live & work in Upwey, Dorset, England, making and selling their work and running Workshops. 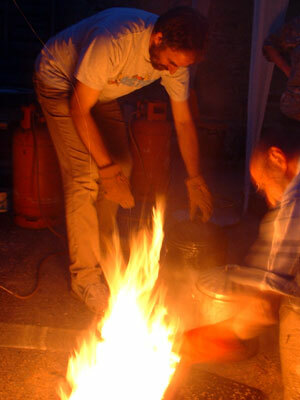 This page gives preview details of the Raku Workshops, so you know what to expect. Follow this link to find out about the weekend workshops sessions. Workshops are usually staged at the Old School Village Hall, Upwey, Weymouth, Dorset, England DT3 5QE . On B3159 between Dorchester & Weymouth, next to Wishing Well Cafe. Sometimes the gear is loaded up and taken to other venues. 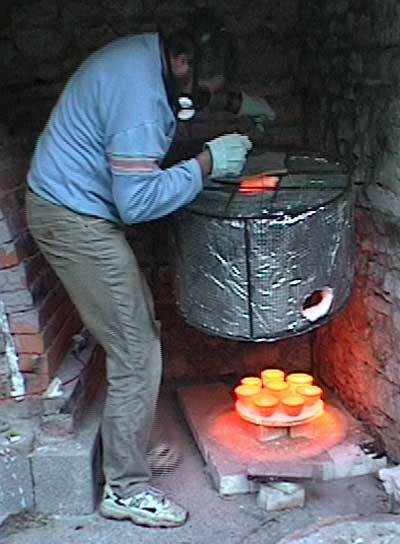 The Raku technique originated in Japan and involves rapid firing of the pots which are removed from the kiln while still red hot and cooled quickly in burning wood shavings. This dynamic piece of performance art produces bowls and vases with lustrous flashes of brilliant colour from the copper rich glazes. 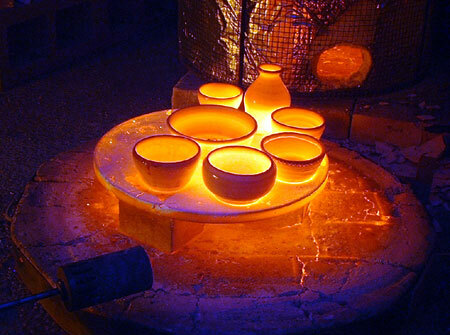 During your session you will have an introduction to the Raku process, chose a pot and be shown how to apply the various glazes to it and then watch it being fired and cooled. You then clean it up and take it proudly home with you. Individuals and Groups of all ages & abilities can join in, each child must be accompanied by an adult. There is no fee for spectators who are welcome to watch and take photos. Wear old clothes & shoes (nothing too inflammable), bring a camera. Biscuited pots are provided, but you can bring your own, please ask for advice. Raw clay suitable for Raku is available on sale in advance. Sessions will be run in all but extreme weather conditions, alternative dates will be offered at no extra charge in the case of abandonment. 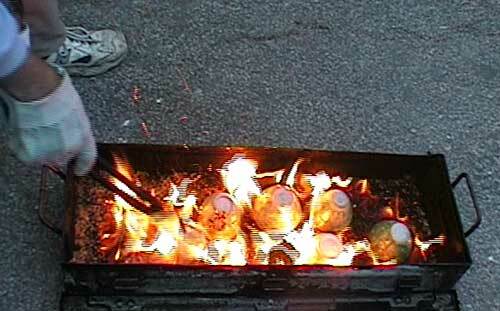 Usually there is time to try throwing pots on the wheel, while the kiln is heating up. Evening classes and taster sessions of other pottery skills are available in Upwey. Details of local accommodation are available on request. To get more details and to book contact Bill Crumbleholme by e-mail. Firing at night can be very impressive. The sawdust in the box burns, reducing the oxygen available for the glaze, promoting more metalic finishes. The inside of this globe is copper which has not been oxidised. 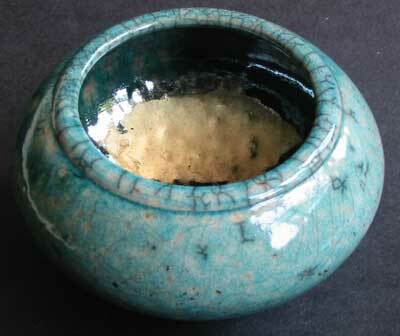 The outside is oxidised and has crackled attractively.